In 'Rock Steady,' Ellen Forney Combines Mental Health Advice, Artistry and Wit Following up on her instant-classic Marbles — about her experiences with bipolar disorder — cartoonist Forney lays out her coping strategies in warm, deftly-rendered and densely informative style. Ellen Forney has a new book out, and the fact that it's about mood disorders is just gravy. Maybe that sentence needs some explaining — starting with the "mood disorders" part. If you suffer from some form of depression or bipolar disorder, you've probably noticed a divide that exists amongst books on the subject. On the one side are probing, literary accounts of what it's like to experience these illnesses — William Styron's Darkness Visible, Kay Redfield Jamison's An Unquiet Mind. On the other side are books about coping. The latter, however comprehensive and necessary, tend to lack poetry (one exception is Andrew Solomon's The Noonday Demon). To do them justice, it's hard to be poetic about communicating effectively with medical professionals, taking pills on schedule and getting enough sleep. Unless, that is, you've got a special knack for making poetry look easy — which is to say, unless you're Ellen Forney. The comic artist is known for writing in a friendly and lovely way about riot girls, drugs, political activism and, in 2012, her battle with bipolar disorder. The bestselling Marbles: Mania, Depression, Michelangelo and Me showcases the combination of traits that make Forney particularly well-suited to address a difficult and dangerous topic like mental illness. Her writing is unpretentious, occasionally goofy and manifestly replete with love for her fellow humans. Her art is full of love, too; her rich, swooping line seems to cradle the reader's eye. 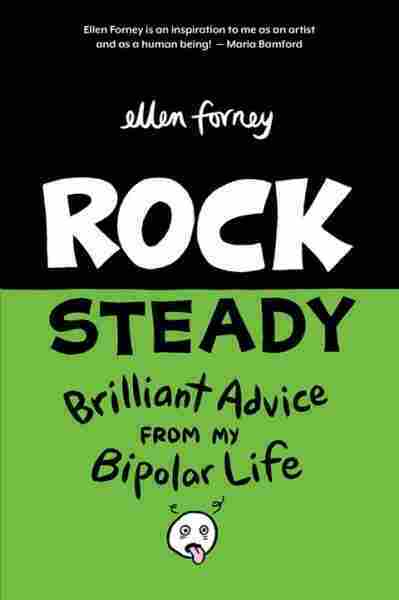 Forney cradles with a vengeance in Rock Steady: Brilliant Advice From My Bipolar Life. This nuts-and-bolts coping book manages to transcend its category and become something even non-depressed readers will enjoy. Forney's alchemy is distilled, literally, in the acronym she's invented to condense her self-care advice: SMEDMERTS. Yes, SMEDMERTS. There is nothing tongue-tickling or otherwise memorable about this acronym. But Forney puts it out there with nerdy aplomb, drawing an adorable, awkward little monster to serve as its mascot. Once you've seen snaggle-toothed Smedmerts pop up throughout the book, even appearing in the form of a Pez dispenser/pillbox, it's easy to run through the litany of Sleep, Meds, Eat, Doctor, Mindfulness, Exercise, Routine, Tools, Support System. Well, easier, anyway. It's hard to be poetic about communicating effectively with medical professionals, taking pills on schedule and getting enough sleep ... unless you're Ellen Forney. Not that Forney's all whimsy. She covers the basics thoroughly. She describes a multitude of different therapies, from traditional and not-so-traditional "talk" options (psychotherapy, cognitive behavioral therapy, interpersonal and social rhythm therapy) to less-common measures (electroconvulsive therapy, acupuncture, hospitalization). A long chapter on medications discusses making sure you take your pills on time (a surprisingly burdensome problem), coping with side effects and determining whether it's safe to go off meds. Chapter 6, "The Danger Zone," tells how to recognize manic or depressive episodes and what to do when you have one. Forney knows that this illness doesn't go away just because you're popping the right pills. But what really distinguishes Rock Steady isn't its thoroughness, it's Forney's personality. Only she would think to design merit badges for all the different phases of treatment. Only she, reproducing pages from her journal in the "red flags" chapter, would include ticket stubs from the De La Guarda show she saw during a manic episode. Only she would pen a section on "Crying and Not Crying," outlining "how to cry inconspicuously in public." And, of course, only Forney would include such delicious cartoons. Her layouts deftly balance information and fun. Even her font exudes warmth. Forney makes her approach seem like the only way to write about depression — or about anything. Rock Steady isn't just a book about "my bipolar life," as the subtitle says. It's a book about life.